My bare toes felt suddenly very vulnerable. The snake, far from being dead, was coiled 3 coils high, with arched neck and flashing fangs, obviously furious at the din that Peter, (helpfully?) banging at the snake’s wheelbarrow hiding place, was making. But thankfully things would be OK now - Bishop was here! Grant and I looked at each other. They didn’t teach you this in bishop school! Peter (helpful again!) threw the wheelbarrow off the snake and leapt out of the way. I shone my flashlight on the snake, leaving Grant, armed with rubber boots and a few nearby boulders, to take on the night battle. It was a large puff adder - it’s penetrating bite quickly fatal. David took one stone to kill Goliath. Grant took five large boulders - but bragging rights have been pretty good all the same. It was the night before Christmas Eve. A canopy of stars filled the African sky. 600 heads bent forward in delighted intensity, as the Opo, sitting on mats crowded around a 10-inch screen, watched the Christmas story. For the first time, they could see the drama that had been filmed 2 years earlier. It was their own re-enactment of the story of Jesus’ birth, performed by their children, in their own language! There is a fascinating brand of realism in these dramas - I’d been told of an earlier play about becoming fishers of men where the fish/men that were caught were then clubbed on the head, as is (apparently) the thing to do with fish. A delightful realism shone through our Christmas play as well. Herod had his regal splendor emphasized with a close-up of his huge tummy, patted regally - (whoops the stuffing fell out - quickly replaced). 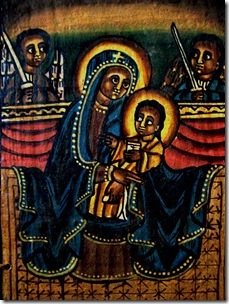 Joseph, after stomping around yelling furiously and then going to the bar and getting drunk, was able, after the angel’s instruction, to accept Mary as his betrothed. With quiet, melodic chanting the monks at St Mecarius monastery were worshiping. Privileged to be allowed to enter at all, I knelt to pray in a beautiful ancient chapel steeped in 16 centuries of daily prayer. The golden light of pre-sunset lit up the ancient icons and the scent of incense filled the air. I felt like I had taken a plunge into a cool refreshing fountain. This month has been filled with baptisms and confirmations and meetings: in the Gambella area and in Addis, in Egypt (dodging various demonstrations), and in Uganda to represent the Province of Jerusalem and the Middle East at the enthronement of the new Archbishop of Uganda, Stanley Ntagali, where I literally “got the t-shirt” - good thing too, because my luggage was lost somewhere between Cairo, Addis and Entebbe. My most poignant meeting was in Uganda with a young couple. He was a Christian, she had been a Muslim. When she fell in love with her husband to be, she also came to know and love Jesus. Then the trouble started. Beaten with iron repeatedly by her brothers and sisters, she was covered in scars. The small cross she had tattooed on her wrist was burned off by her brothers with battery acid. She was then imprisoned, but in a dream was told to bend the iron bars of her cell and walk to freedom. Awake, she took hold of the thick steel; it melted in her hands as if made of butter, and out she walked. Dreams of Jesus and Christian leaders encouraged her. Her husband, also beaten on several occasions, had to leave his law practice and flee his country, no longer employable, as his picture had been published in the press as someone attempting to corrupt a Muslim girl - by radical opinion someone who should be eliminated. 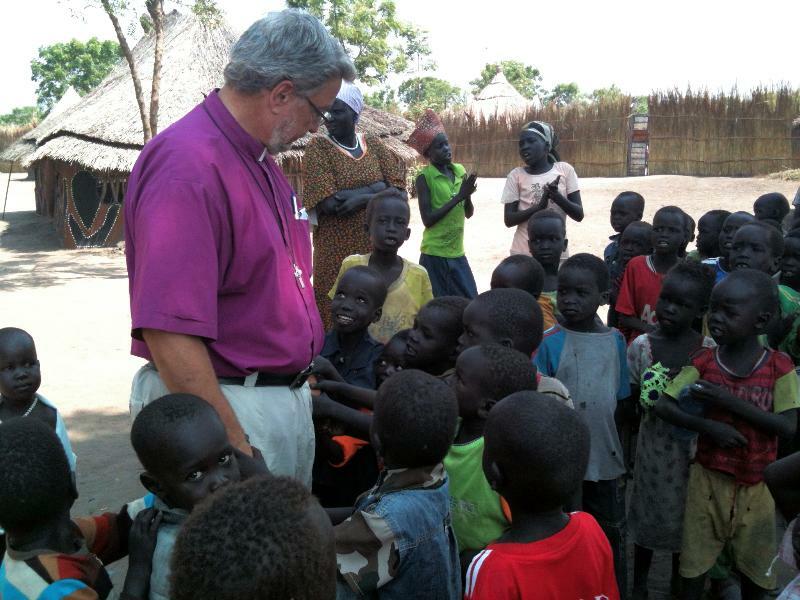 Together they fled to Juba in South Sudan, but could find neither work nor a place to stay. 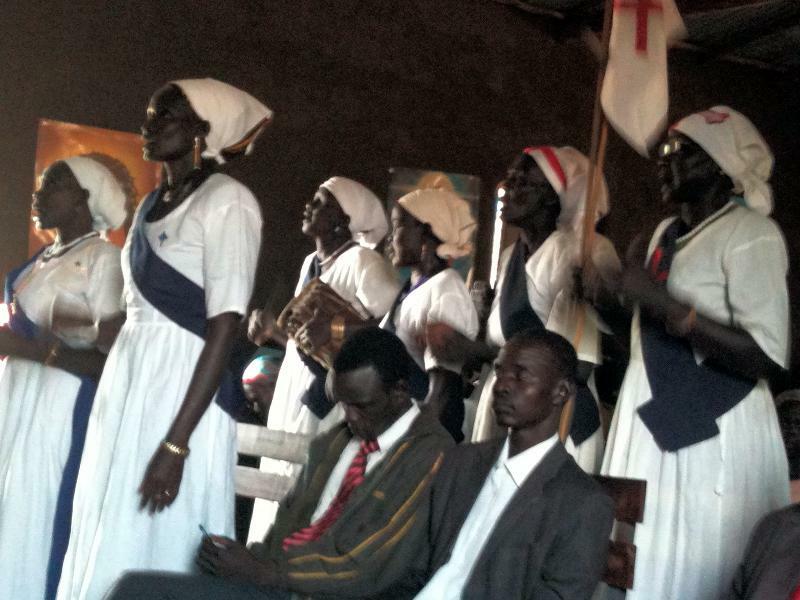 They headed south and in Kampala, Christians began to help them. They have refugee status in Uganda at the moment. He is looking for work, but his English is poor and hers non-existent. Their story, of course, is not unique. Christians are intimidated, persecuted and, yes, martyred on a regular basis in today’s world - there have been more martyrdoms in the modern period than at any other time in history. Please pray for this couple as they build a new life in a safe place - and for many like them, still in danger.